You guys know that I love myself a good bonfire right? Now that the weather has gotten warmer, our game nights have turned into bonfire nights and I think I’m falling even more in love with our group of friends. We’ve had the same group of friends for years, they have followed us through many moves and our house is always and will always be known as the gathering house. I think it’s because I have that mama bear feeling and give everyone a warm welcome. Or it could be because I ALWAYS feed everyone, so they know that if they come over here they are going to get some good food and fun. 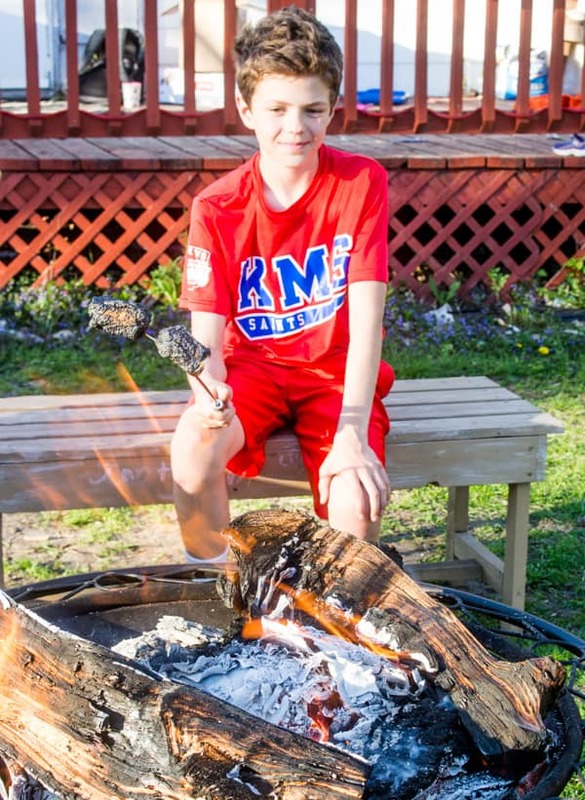 So when it comes to warm Summer nights, we always have one of our friends on S’mores duty! Nothing completes it more than a gooey and delicious home-made S’mores. 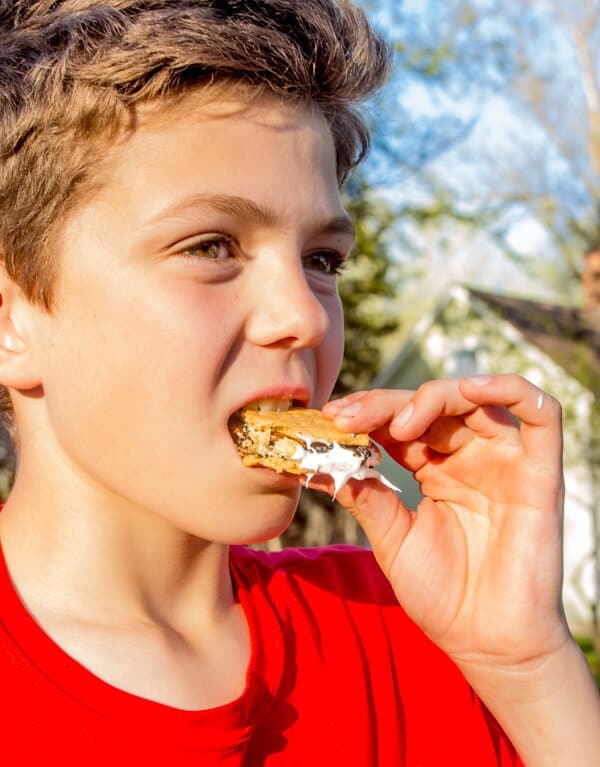 Did you know that 71% of those hosting summer get togethers think that S’mores are the perfect treat as well?? * It’s the perfect end to our Summer grill outs. When I was growing up, I was an only child. My dad was my rock and always hung out with me. We would take walks around our property and at the end of the evening we would quickly light up our little homemade rock fire pit behind our garage and my dad would find me a stick and we would make ourselves some S’mores. That is a tradition that I have passed down to my kids. There’s never a bonfire that S’mores don’t play an important part of. While we used to love finding our own sticks and going old school, we’ve updated to roasting rods that can hold more than one marshmallow at a time and aren’t at risk of starting on fire which always happened to me as a child. And for even easier access to S’mores, roasting them on your grill works really well too! 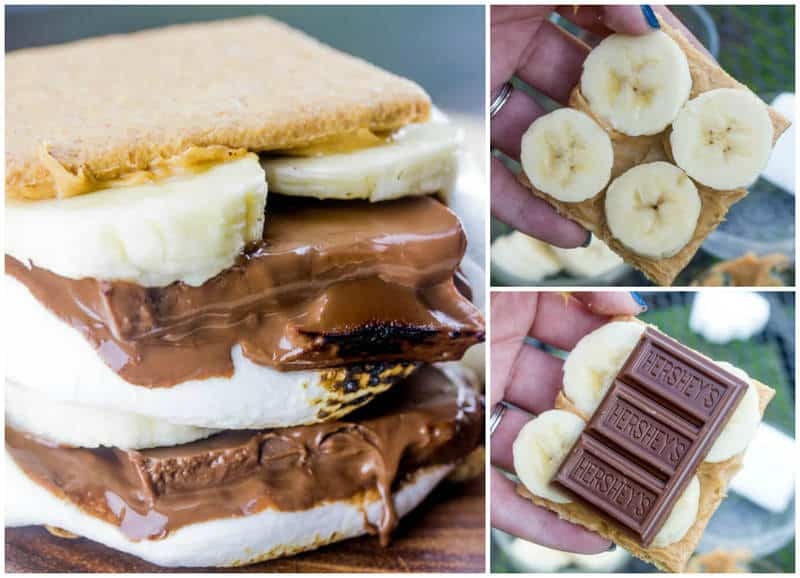 My kids love coming up with crazy flavor combinations, but so far our absolute favorite has to be this delicious Peanut Butter Banana S’mores! Seriously, bananas and peanut butter are always ingredients we keep on hand in our house because well you know…kids. Fluffernutter sandwiches are my 10 year olds favorite sandwiches and I love bananas so we decided at one point to combine the two and create a delicious twist on the classic S’mores. These are super easy. What you need to do is grab yourself some HONEY MAID Grahams, spread about 1 Tbs peanut butter over the top of it then layer about 4 slices of cut up banana and some HERSHEY’S Milk Chocolate pieces! 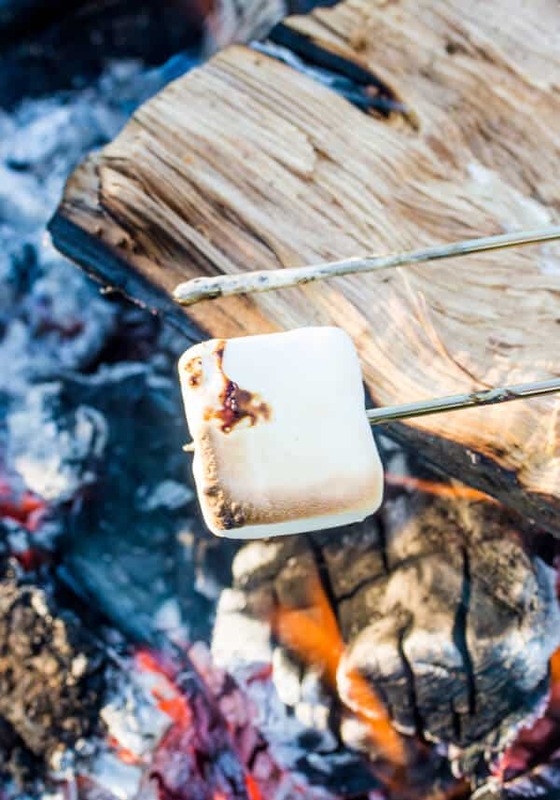 Then you roast yourself up some JET-PUFFED Marshmallows to your favorite doneness…mines a little burnt, I will not lie to you. 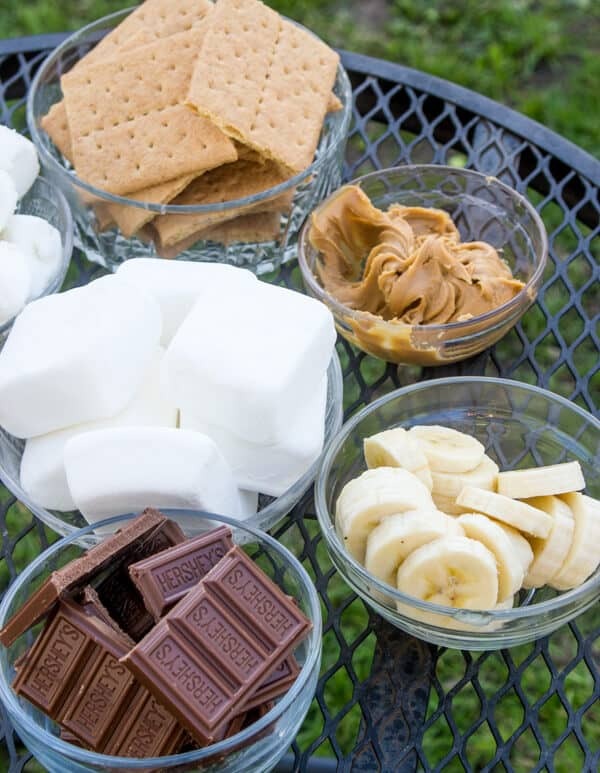 Then you squeeze them all together and you have yourself the PERFECT S’mores! These easy to make treats are perfect for family gatherings for the long summer holiday weekends,at cookouts with friends or just on a nice summer night relaxing with the family. 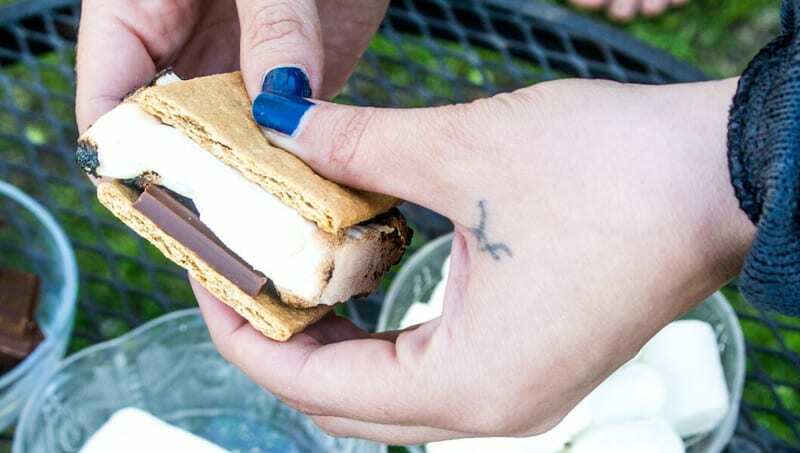 S’mores are our go-to treat of the Summer and that will probably never cease to stop. The nostalgia behind making one of these classic treats is unsurpassable! 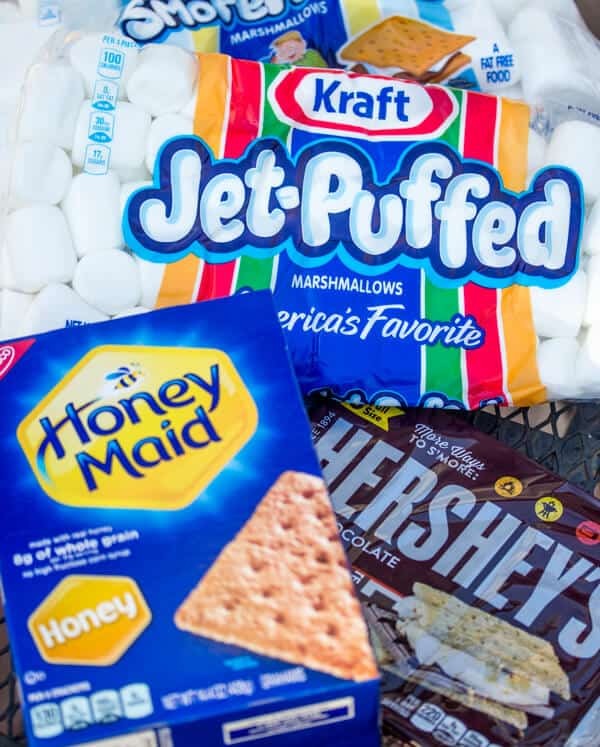 What is your absolute favorite flavorto make for S’mores?! Leave me a comment and let me know so I can try out some fun new ideas!